The EUR/USD added onto yesterday’s losses after the Dollar appreciated across the board in reaction to stronger than expected CPI and PPI data from China. Inflationary data in China indicates its central bank may be enticed to tighten liquidity further should prices continue to rise. The concept that China may press down on the breaks has raised concern recording global economic growth since China has been the engine behind the recovery. In addition to the data set from China, EU PMI data printed negatively mixed. Although Manufacturing came in line with analyst estimates, Services shrugged a couple points below estimates. More discouraging economic data from the EU gave investors ammo to sell off the EUR/USD despite the extent of the past few days. However, the EUR/USD is attempting to bottom right now as gold pops and the Dollar weakens across the board in reaction weekly U.S. Unemployment Claims coming in much higher than analyst expectations. The rise in claims has tempered enthusiasm surrounding America’s economic recovery, leading to speculation that liquidity will remain loose in the U.S., a Dollar negative. Meanwhile, markets could get political today with President Obama set to announce his proposal for new financial reforms. Should investors view the new reforms as a negative for banks this could lead investors to sell the Dollar. The EU will keep the data train rolling tomorrow with the release of Industrial New Orders and the Belgium NBB Business Climate. A positive data set could prove helpful in the EUR/USD setting a new bottom. Technically speaking, the EUR/USD understandably face multiple downtrend lines considering the extent of its. However, our downtrend lines have quite a bit of space between them, meaning the Euro could gain back some ground should the Dollar experience broad-based weakness. 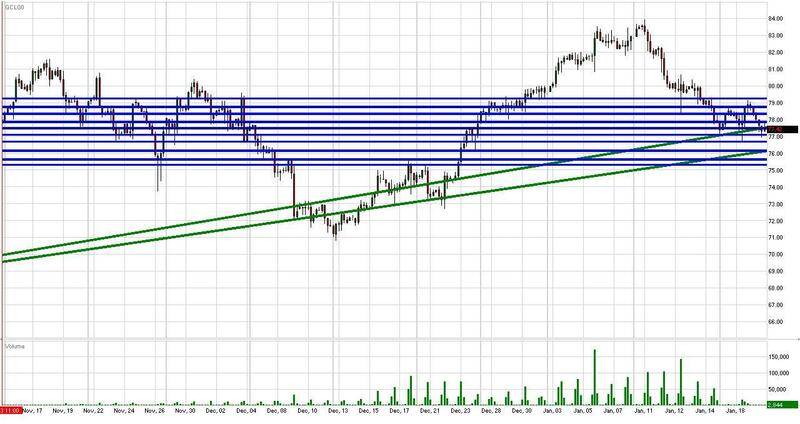 As for the downside, we’ve placed a new 1st tier uptrend line running through intraday lows. Additionally, the EUR/USD does have the psychological 1.40 level serving as a technical cushion. The 1.40 area alone could prove to be enough of a psychological influence to allow the EUR/USD to calm and bottom out. The Cable has bounced off of our 3rd tier uptrend line after experiencing a large leg down during the Asia trading session. The Cable finally participated in the broad-based Dollar strength taking place over the last couple days after pricing data from China printed hotter than anticipated. The rise in China’s CPI and PPI indicates there could be further tightening down the road since the government doesn’t want the economy to overheat. Tighter liquidity in China could have a noticeable impact on the performance of the global economy since China has been an engine driving the recovery from the nadir of the recession. In addition to the news from China, the UK released M4 Money Supply data which was shockingly low (-1.1%). This is the largest decline in the money supply since the beginning of the recession and could have placed further downward pressure on the Cable today. Meanwhile, investors are awaiting the Philly Index from the U.S. followed by Obama’s proposal for new financial regulation. Should the Philly print weak and investors take Obama’s proposal as a negative for the U.S. economy, we could witness further weakness in the Dollar as confidence surrounding America’s recovery wanes. Speaking of which, the primary reason behind the Greenback’s weakness over the past hour or so is the much higher than expected weekly Unemployment Claims figure. Higher unemployment could discourage the Fed from tightening liquidity any time soon, a Dollar negative. The UK will release Retail Sales tomorrow and investors are expecting growth of 1.3%, which would be the largest growth rate since January of this year. Technically speaking, as we mentioned the Cable has held up very well considering the plight of the EUR/USD. The Cable has held strong above our 4th tier uptrend line and still has multiple uptrend lines serving as technical cushions along with 1/15 and 1/13 lows. As for the topside, the Cable faces multiple downtrend lines along with 1/15 and 1/19 highs. Furthermore, the psychological 1.645 area could prove to be a technical barrier should it be tested. The USD/JPY continued to strengthen today, driving north towards 1/14 highs as the Dollar strengthened across the board. Investors exited the risk trade in a hurry after China’s CPI and PPI data printed hotter than analyst expectations, indicating China’s central bank may need to tighten liquidity to temper inflation. A more hawkish monetary policy stance from China could have ramifications for the global economy as a whole since China has been an engine driving the recovery. Investors reacted by heading to the Dollar for safety, a positive development for the USD/JPY considering the BoJ is intent on countering deflation. However, the USD/JPY seems to be topping out at our 1st tier downtrend line, just below 1/14 highs, after U.S. economic data printed weaker than expected. Both weekly Unemployment Claims and the Philly Index disappointed, implying the Fed could refrain from tightening liquidity. The Dollar has weakened in reaction and this development has stalled the USD/JPY’s advance. Meanwhile, investors are awaiting Obama’s proposal for future financial reform. The U.S. and Japan will be quiet on the data wire tomorrow. Technically speaking, the USD/JPY has multiple uptrend lines serving as technical cushions along with intraday and 1/19 lows and the highly psychological 90 level should it be tested. As for the topside, the USD/JPY faces multiple downtrend lines along with 1/14 and 1/12 highs. Gold is undergoing a hefty selloff right now as the S&P futures drop through key technical supports in reaction to weaker than expected weekly Unemployment Claims and Philly Manufacturing data. Today’s negative data set tipped the scale considering the rally the Dollar has been on lately. The Dollar initially rallied during the Asia trading session after China’s pricing data printed hotter than analyst expectations, extending gains in the Dollar against all major pairs as investors headed for safety in fear of tighter liquidity from China. Gold followed the Dollar’s lead, declining to its psychological $1100/oz level before bouncing off our 1st tier uptrend line. However, gold has since dropped below our 1st tier and we notice a similar pullback in the S&P futures. Hence, we could be entering a more extensive decline for both gold and the S&P futures over the near-term. Our 1st tier uptrend line carries added weight since it runs through December 09 lows, or the psychological $1075/oz area. Meanwhile, investors should keep an eye on the S&P futures and monitor their ability to stabilize for such an occurrence could allow gold to set a temporary bottom. Crude futures are holding up very well considering the rally taking place in the Dollar coupled with a key pullback in the S&P futures. Both developments would normally drag crude lower due to correlative forces. Furthermore, weekly Unemployment Claims printed much higher than analyst expectations, dampening the outlook for demand over the near-term. However, crude is holding strong and is likely deriving its strength from positive economic data from China. Although Industrial Production printed shallow of expectations, GDP and Retail Sales impressed. Therefore, it seems consumption in China continues to boom, a positive catalyst for crude considering the impact this has on the outlook for demand. That being said, crude futures could eventually turn south should declines in U.S. equities accelerate along with additional Greenback appreciation. The optimism stemming from China’s positive economic data may only last until the end of the week, while trends in the Dollar and equities should have a more considerable impact on crude over the near-term. Technically speaking, crude futures are still trading below their highly psychological $80/bbl level with 1/17 and 1/19 highs serving as technical barriers. As for the downside, the futures currently have our 1st and 2nd tier uptrend lines serving as technical cushions along with 1/19 and 12/23 lows. Furthermore, the psychological $75/bbl level could serve as a solid support should it be tested. The S&P futures are undergoing a key technical selloff today, dropping below our previous 1st tier uptrend line after weekly Unemployment Claims rose more than expected and the Philly Manufacturing Index printed light. The decline below our 1st tier uptrend line was an important development since our 1st tier runs through December 18 and November 26 lows. Hence, the S&P futures could be in for a retest of the psychological 1100 level over the medium term. Today’s discouraging U.S. data set was the trigger for a pullback building up in reaction to movements by China’s central bank in an effort to soak up liquidity. Tighter liquidity in China could slow down the global economy as a whole considering China has been an engine driving the recovery since the nadir of the recession. Today’s data set from China relayed these fears of inflation with CPI and PPI both printing hotter than expected. Hence, if this rising trend in prices continues don’t be surprised if China gets more aggressive with its tightening measures. Meanwhile, investors will be tuning into Obama’s speech today as he outlines his proposal for financial reforms. It will be interesting to see how the market reacts to this political development since it could have a negative impact on U.S. banks. The U.S. will be quiet on the data wire tomorrow, leaving current momentum forces in play. Technically speaking, we have formed a new 1st tier uptrend line which runs through November lows, or the 1025 area. In addition to our 1st tier uptrend line the S&P futures also have January lows and the highly psychological 1100 level serving as technical cushions. As for the topside, the S&P futures face December highs along with a wall of downward momentum.